Earlier today, Twitter rolled out a pretty killer new feature: Place support for geolocation. With it, you can tag your tweets to a specific place you’re at, or pipe in your check-ins from Foursquare and Gowalla to do the same thing. Tonight, Twitter can’t seem to find anything, let alone the new Places. The service has now been completely down for over an hour. For long-time users of Twitter, this type of downtime is nothing new. But for the majority of users who have signed up in the past several months, they’re likely accustomed to a pretty stable service. Well, welcome to our world. 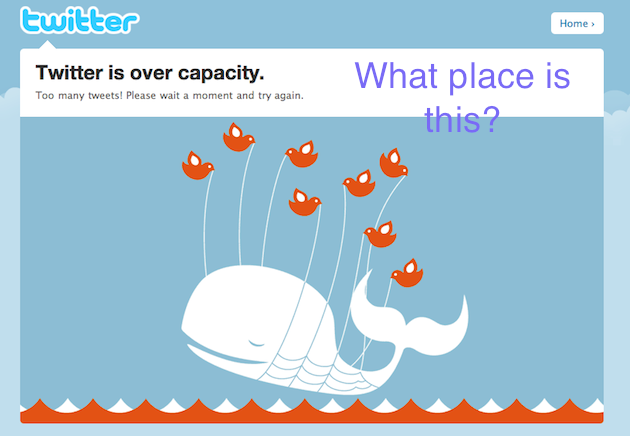 I don’t know what’s been going on the past couple of weeks, but Twitter has definitely been struggling to stay up. We are experiencing site-wide availability issues due to scheduled maintenance. We’re currently working to address the issues. We’ll update with more information as it is available. Hmm. That doesn’t sound like a regular “scheduled maintenance” message to me. Might I recommend 15 or so alternative things to do? We’re currently experiencing site availability issues resulting from the failed enhancement of a new approach to timeline caching. Our infrastructure and operations engineers are currently working to resolve this. We’ll update you soon with an ETA. We’re currently experiencing site availability issues resulting from a failed enhancement of the site. Our infrastructure and operations engineers are currently working to resolve this. The site could be down until approximately 3am PT. We’ll continue to update the status blog. That’s 5 hours from right now.